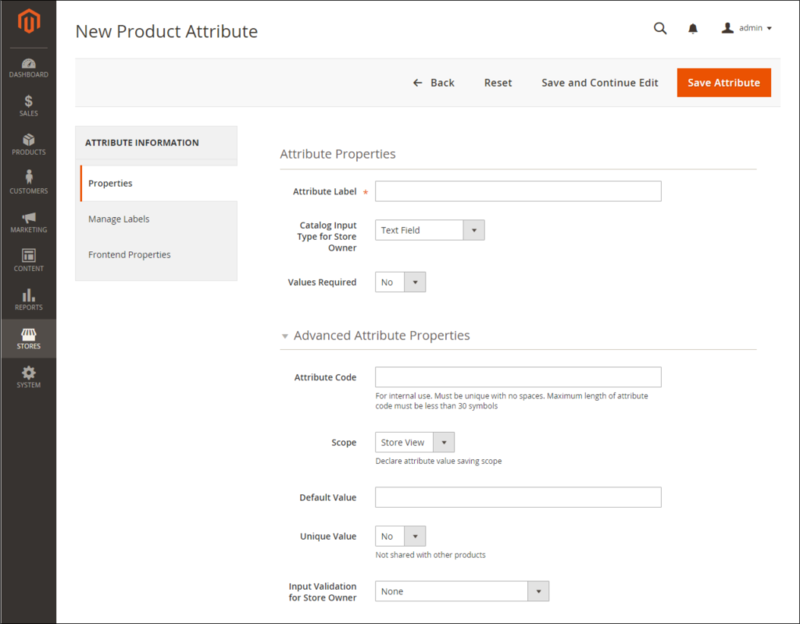 Store administrators can create attributes while working on a product, or from the Product Attributes page. In this article, we describe a tutorial on how to create attributes from the Stores menu. On the admin sidebar click Stores. Under Attributes click Product. Input an Attribute Label to identify the attribute. Set Catalog Input Type for Store Owner to the type in input control to be used for data entry. Under Manage Options, click Add Option. For each option that you want to add to the list, repeat the previous step. Select Is Default to use the option as the default value. Input Attribute Code in lowercase, no spaces. 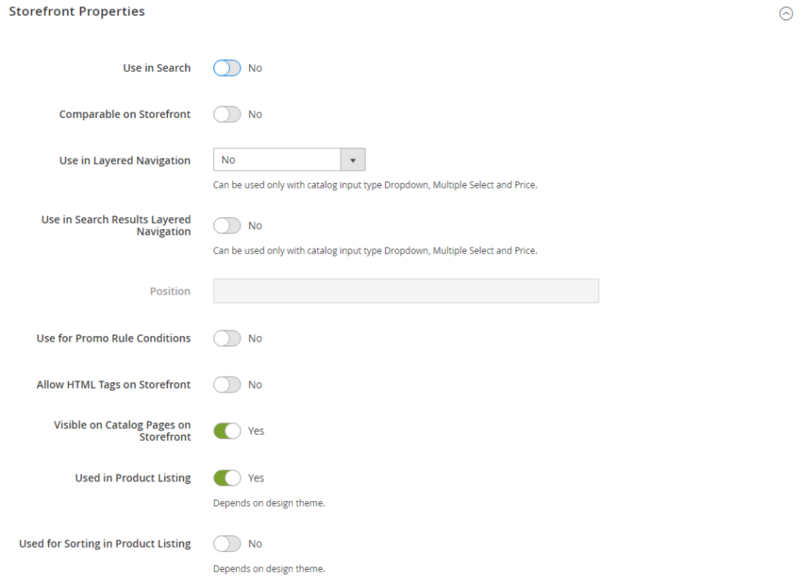 Set Scope to select the place in your store hierarchy that the attribute can be used. To avoid duplicate value, set Unique Value to “Yes”. Add to Column Options Includes the attribute as a column in the Products grid. 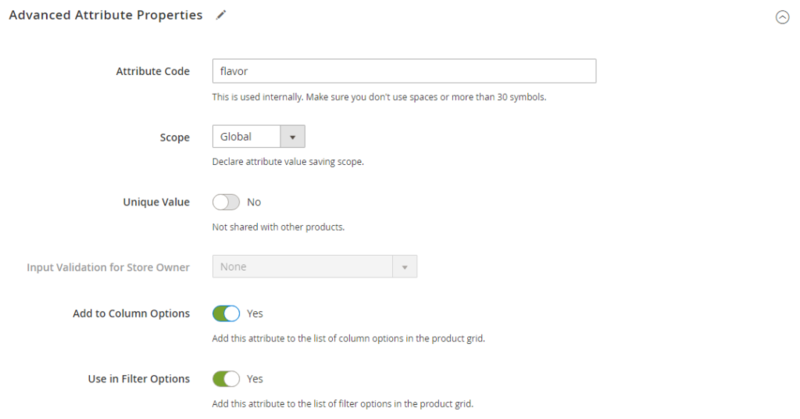 Use in Filter Options Adds a filter control to the column header in the Products grid. Open the Manage titles tab, input the Title to be used as a label for the field. On the left of the panel, click Storefront Properties. Set Use in Layered Navigation to “Yes” to use the attribute as a filter in layered navigation. Set Use in Search Results Layered Navigation to “Yes” to use the attribute in layered navigation on the search results pages. Enter a number in the Position field to indicate the relative position of the attribute in the layered navigation block. Set Use for Promo Rule Conditions to “Yes” to use the attribute in price rules. Set Allow HTML Tags on Frontend to “Yes” to allow the text to be formatted with HTML. This setting will enable the WYSIWYG for the field. Set Used for Sorting in Product Listing to “Yes” to use the attribute as a sort parameter for product listings. Click Save Attribute after completed.